This Sunday, 27 October 2013, join us for our next leisurely architecture ride looking at the religious architecture of London. 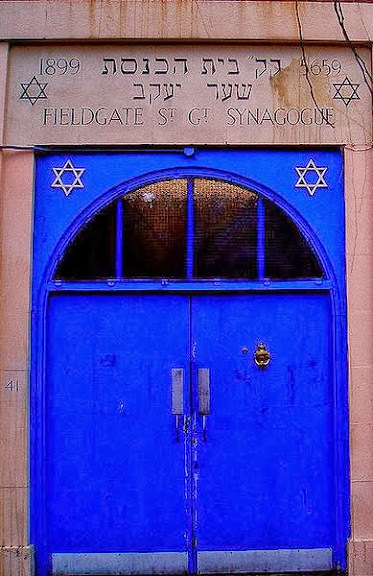 This ride will explore the architecture of religious buildings as represented by some of the major faiths of London's diverse communities. We will explore how religious traditions and beliefs find expression in the architecture of church, synagogue, mosque and temple. Some of the places of worship have been converted from their original use, reflecting successive waves of migration, carrying the religious symbols and customs of new ethnic groups which in contrasting styles bring together materiality with spirituality. 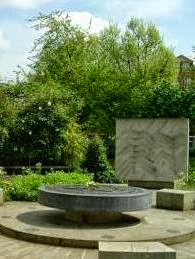 Meet in the Tibetan Peace Garden at the Imperial War Museum, Lambeth Road, London SE1 6HZ at 10.45am for an 11am start (remember clocks go back an hour the night before). Lunch will be in Brick Lane and the ride will end at approximately 4pm. 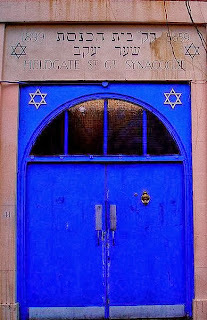 We plan to visit Sandys Row Synagogue which asks for a small donation from visitors. The ride will be led by John Heyderman and Tessa Wright (tel 07949 785258). No need to book, just turn up on the day with a roadworthy bike! 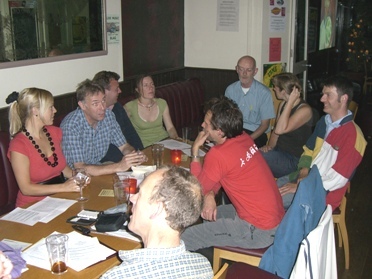 We hope you can join us for Lambeth Cyclists' meeting this evening (15 October 2013) 7:30pm at the Effra Social. We are usually in the room to the right of the entrance or at one of the tables at the front of the pub, ask if you cant see us! We will be joined at our meeting by Amy Summers, newly appointed LCC Activism Coordinator who will be talking about LCC central campaigns especially the one leading up to the local elections in May 2014 and how our local campaigning can complement the main LCC campaign focus. We will also be looking at other developments in cycling in the borough followed from approximately 8:30 onwards by drinks - it would be great to see you for all or just the second part of the meeting. Fifteen of Lambeth's 21 Council neighbourhoods are in the top 100 places with the highest cycling population in London. 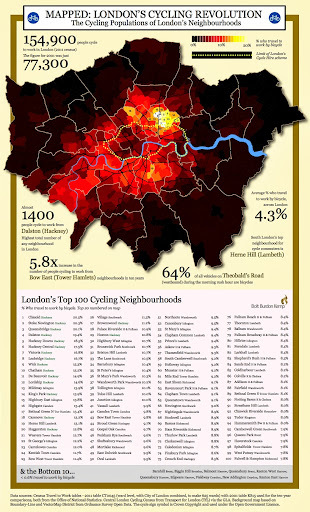 A new diagram published by Bolt Burdon Kemp using data from the 2011 census and Transport for London shows where London people who cycle to work live and they are overwhelmingly concentrated in inner London boroughs such as Lambeth, Southwark, Hackney, Camden, and Tower Hamlets. Whilst the large numbers of people cycling in Lambeth is cause for celebration the figures show that at most just over one in 10 people in the borough is cycling to work. There is still much to be done to encourage as many people as possible to cycle for their journeys to work, to school, to the shops and for leisure purposes. We want to see all 21 of Lambeth's wards in the top 100 neighbourhoods for cycling in London.